UPPER WEST SIDE — A self-proclaimed "posture guru" wants to put the spring back in the neighborhood's step. 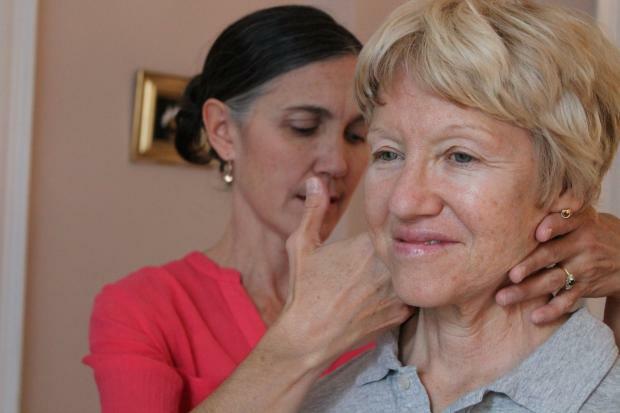 Upper West Sider Allison Foley-Graham, a private teacher of the more than century-old Alexander technique, is expanding her in-home practice — and she believes the neighborhood's backs and necks are prime targets. She joked that she's poised to become "the posture guru of the Upper West Side," adding that posture improvement is just one part of the technique that draws students in. Using the Alexander technique, developed by an Australian Shakespearean actor, teachers like Foley-Graham guide discussions and offer help on how to move and carry oneself better. She doesn't provide a set system or program to follow, but aims at participants "unlocking the natural ability to be upright with greater ease," she said. "When a person lets go of their tension, they do feel like they're floating," said Cary Gang, a student of Foley-Graham's and a local jazz singer. Gang sought out Foley-Graham a few years ago after a recommendation from her voice coach. She said she felt "hopeful" that she could lose hard-wired bad habits and discover a better way of moving, but confided that her quest is very much a work in progress. Foley-Graham taught the technique, which is popular among performers, at Barnard College for a decade, but she was laid off at the end of May when the school reduced its physical education department, she said. The change was actually a blessing in disguise, she said. Foley-Graham said the Alexander technique is now coming back in style, as it was during its American heyday in the '70s, making a private practice more viable. Foley-Graham has heard from other teachers that while the recession hit the field hard — people cut back on additional services like Alexander technique classes — they're now seeing a growing interest in the practice. The current emphasis on achieving a mind-body connection and people's growing obsessions with yoga and Pilates have lead more participants to use the technique, she explained. Then there's new scientific research pointing to the brain's ability to change, giving people new hope that they can retrain their bodies, she noted. "Our brains do not stop growing at age 25," Foley-Graham said. The technique's focus on realigning the neck, head and back is also appealing in today's chained-to-the-computer culture, she added. While many come to Foley-Graham in crisis mode — after they've had an injury or severe pain — more people are seeking her out proactively as a way of coping with stress and tension. "People are surprised when they release that tension," she said. "They say, 'I feel young. I feel light.'" If students are willing, they can also gradually change the way they look. "People think it's inevitable that you curve over [with age], but it's not inevitable," Foley-Graham said. Performers, like Gang, often report a newfound awareness of their bodies that helps them on stage. "If you're a performer, it makes a whole lot of sense," she said. "It frees you to your normal state," rather than holding a tense, unnatural pose while singing. While Foley-Graham's new practice is still in its infancy, with just a couple people signed up to visit her home for sessions in the West 90s, she's building her business by reaching out to local community hot spots, including libraries, synagogues, coffee shops and schools. The principal of a local elementary school even contacted Foley-Graham expressing interest in a collaboration with the school, she said. These days "kids already have back pain," she noted, but "their habits are not as firm." On Wednesday, Oct. 16 at 5:30 p.m., Foley-Graham is hosting an introductory group session at the Morningside Heights Library. She's also holding classes at the American Center for the Alexander Technique in November and December. Foley-Graham's sessions run $75 for an hour.